*Regular nightly rate is $279. Weekly rate is stay for 7, pay for 6. Your reservation total will include a cleaning fee and bed tax in addition to the rental rate. 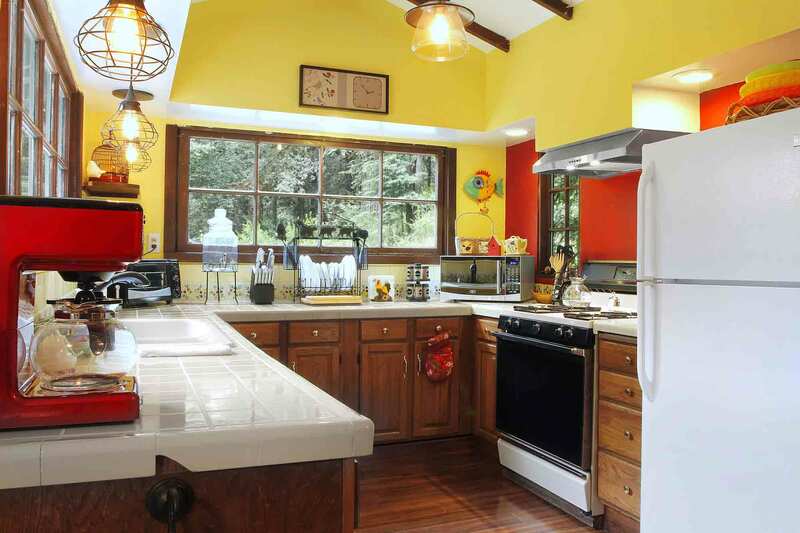 Private, Contemporary Guerneville Home on Wooded Hillside, Forest Views, Gas Fireplace, Hot Tub, Outdoor Dining. 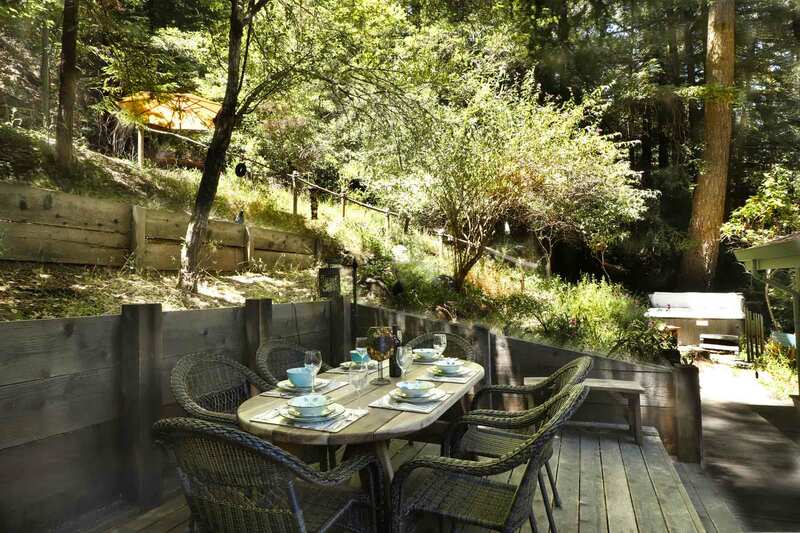 Walk to River Beaches, Downtown Guerneville, Dining. Short Drive to Hiking, Golf, Wine Tasting. WIFI. Keyless Entry. Your Well-Behaved Dog is Welcome! 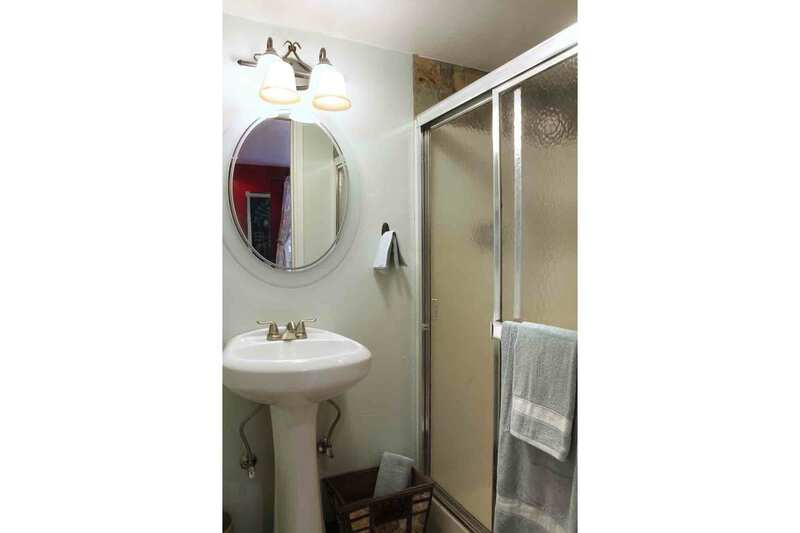 On the lower, entry level, there's a master bedroom suite with full bath and private deck. Up a flight of interior stairs, the main living level has a living room, kitchen with eat-in dining that opens to the rear yard, outdoor dining, and hot tub. An exterior set of stairs leads back to the parking area. Also off the living room, there are three bedrooms, one with a deck connecting with rear yard, and another full bath. House is approximately 1410sf. Max Occupancy: 8. Max Automobiles: 4. Quiet Hours 10pm-7am. No outdoor amplified sound at any time. The pics don't do this place justice. Cozy and homie place, great kitchen, tons of seating outside, powerful shower downstairs, close to grocery store, super cozy beds/linens, nice assortment of dishes, not to mention the best sleep I've ever had! Only wish check out time was a bit later, felt a little rushed. "We had a great time! " We had a great time! We were able to accomplish everything we needed in the kitchen and everything in the house worked just fine. The house is not set up for small children (under 5) so I wouldn't stay there again with our little ones, but I don't fault the owners for that, it's definitely not marketed for children either, just a heads up for those looking for a place with their kids. 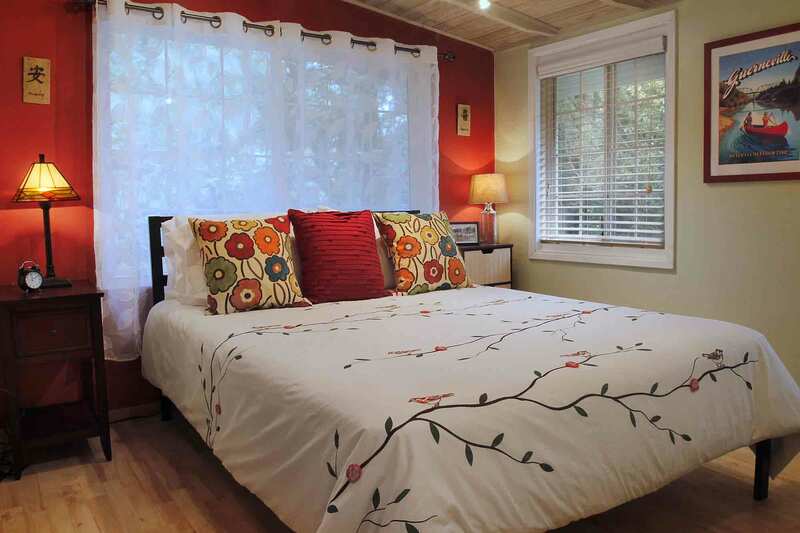 The location is great, we walked to downtown Guerneville very easily. We very much liked the place - it has character, is clean and well equiped. "Sweet place in the woods"
Sweet place in the woods. A great hangout with friends. 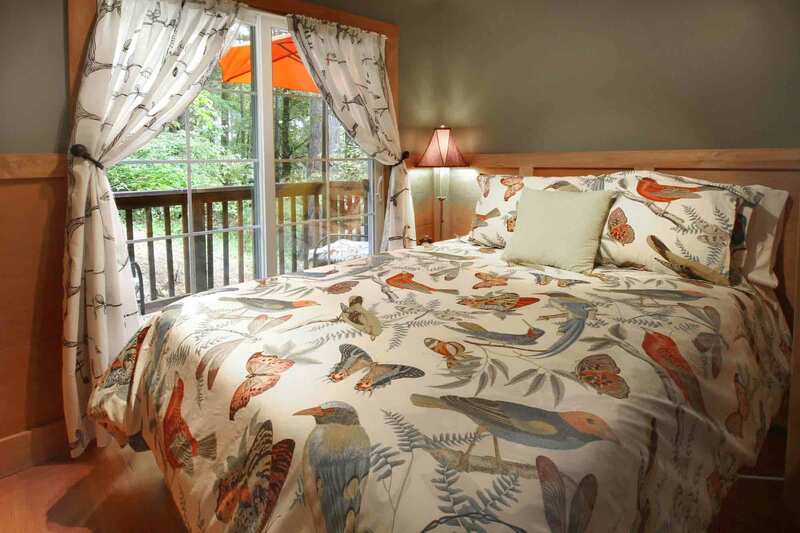 The outdoor area is a real highlight, and the overall cabin feel is cozy with plenty of amenities. "We loved our stay at Spice of Life! " We loved our stay at Spice of Life! A beautiful house in a great location - we walked to town and back without having to worry about designated drivers. We also loved the hot tub! It did lose warmth when the top was open and took a while to get hot again, but it was still very enjoyable. FYI, the fireplace doesn't burn wood but it's warm and pretty to look at. The home was cozy and stylish, we played some games in the living room and appreciated the space. It was clutch to have the extra cots and beds and furniture were very comfortable. 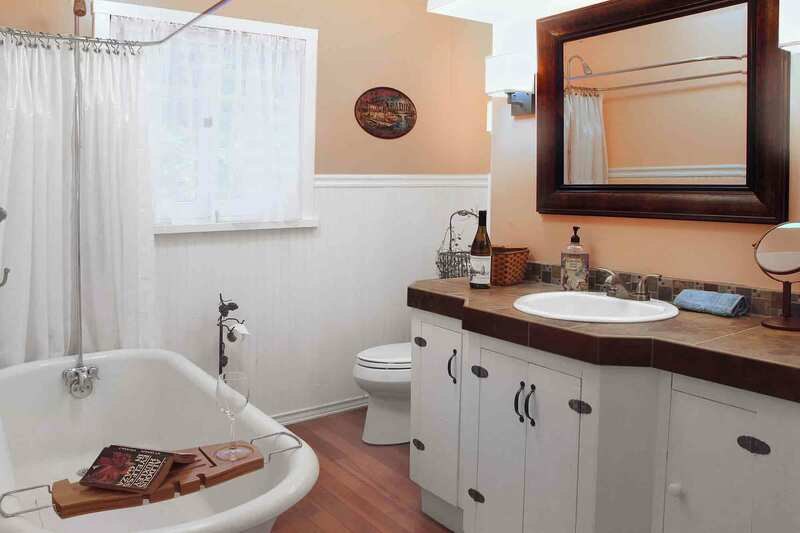 Wish I got a chance to take a bath in the tub - looked very relaxing. If you have a group staying just be aware that noise travels easily from the living room to bedrooms and in-between bedrooms. The driveway could have fit more than 4 cars if they squeezed in. Check-in was super easy and the rental company was very communicative. Guerneville is a cute town and we especially enjoyed the queer dive bar Rainbow Cattle Company. I'd definitely stay here again and recommend highly to others! 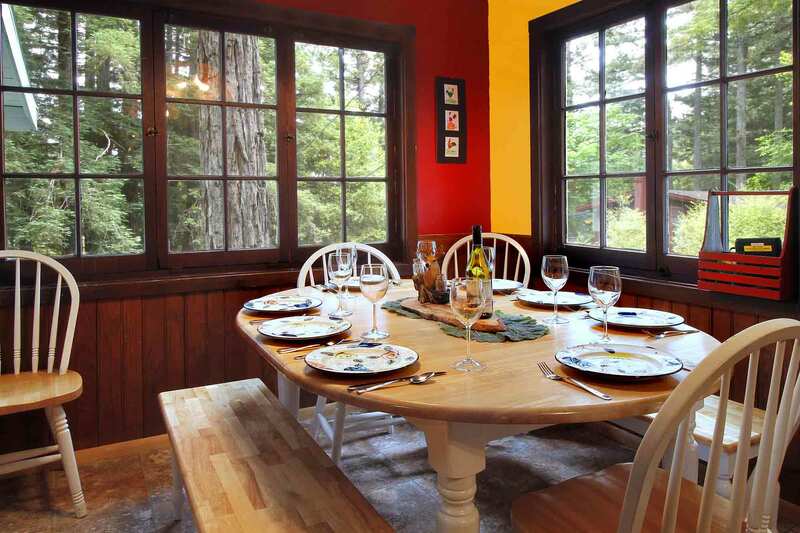 "Lovely cabin surrounded by redwood trees"
Lovely cabin surrounded by redwood trees. 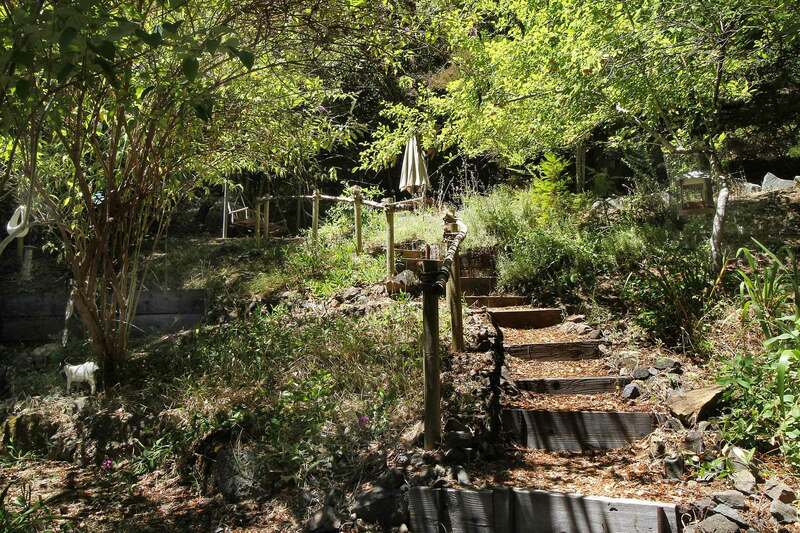 A ten minute walk to downtown Guerneville and a river beach, this place is perfect for families (we brought a three year old) or people looking to enjoy late nights at the local bars. The decor is adorable, felt like home. This place had everything we could ask for in a weekend rental. Very quiet area yet walkable to many restaurants and bars, and of course the river. 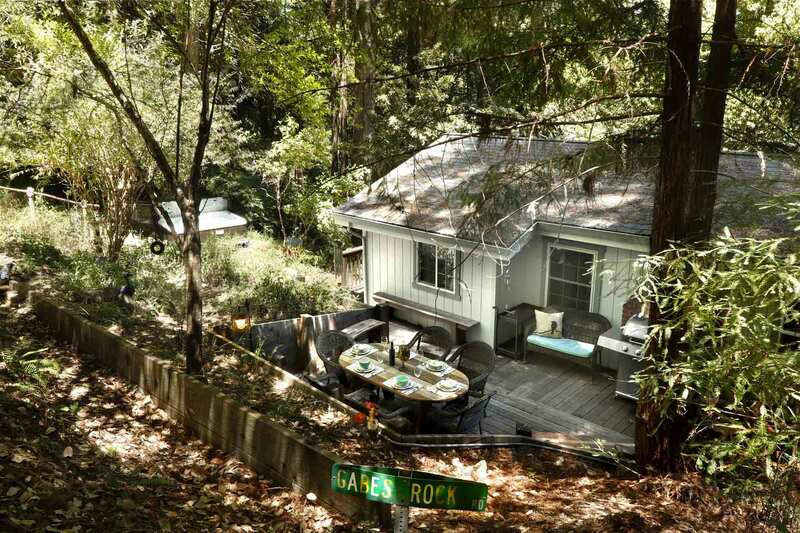 "Wonderful 4 bedroom home in the redwoods..."
Wonderful 4 bedroom home in the redwoods, a 7 minute walk to downtown Guerneville, 4-person hot tub, full of cabin charm, nice bedding, and a great patio space! Would stay here again! The house is exactly what you would expect from the description and photos! We stayed with 3 couples and it fit us all nicely. The 4th twin bed room is TINY so i'd only suggest utilizing it for a child. Despite it being cold outside, their fireplace and space heaters kept everything extremely warm. The kitchen has all of the basics that you would expect so we didn't bring anything of our own except for extra towels. 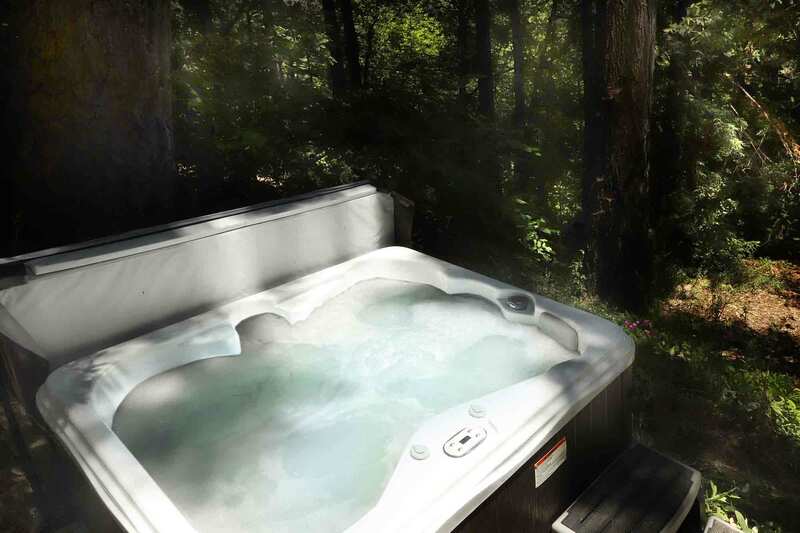 The hot tub only fits 3-4 people so keep that in mind if that's one of the main reasons you want to stay! The location is less than half a mile from the downtown which made it easy to walk to dinner or lunch. Overall, great NYE cabin close to hikes and wine tasting! 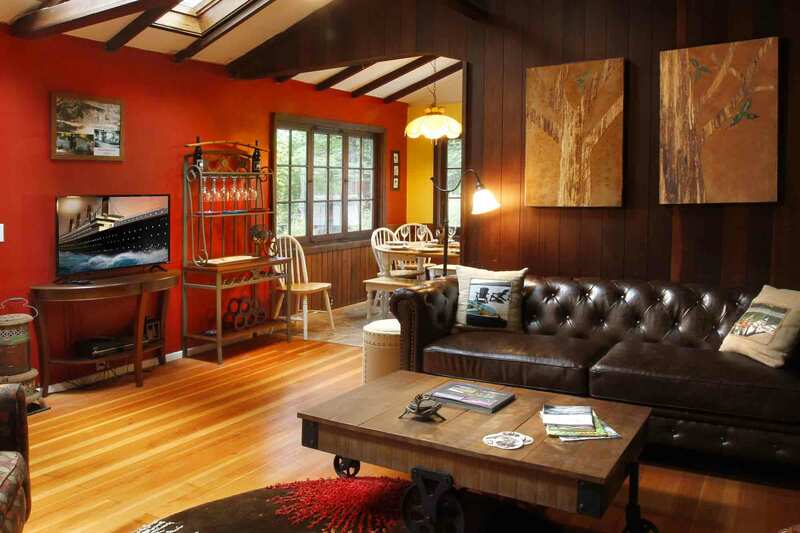 The place was adorable, comfortable and the perfect location in the redwoods. Close walk to town was very convenient and the hot tub was a nice bonus! The kitchen was stalked somewhat well although we cooked the whole time and would have preferred a little more variety in the pan sizes. We did however request a larger pot and a rubber spatula and the rental company was quick to deliver it. One thing I will say is that the place was not as clean as we would have liked after spending 300 dollars for a cleaning fee. There was a considerable amount of dust and dirt in the corners and we felt like we didn’t get the cleanliness we paid for. Other than that it was the perfect location for our family Christmas getaway! Super cozy old house, great place for the 8 of us and our dogs. "This was the perfect home for my family..."
This was the perfect home for my family of 8 to stay on vacation. The home is beautiful and very clean and comfy. We loved all the games and the hot tub was amazing. This location is PERFECT. 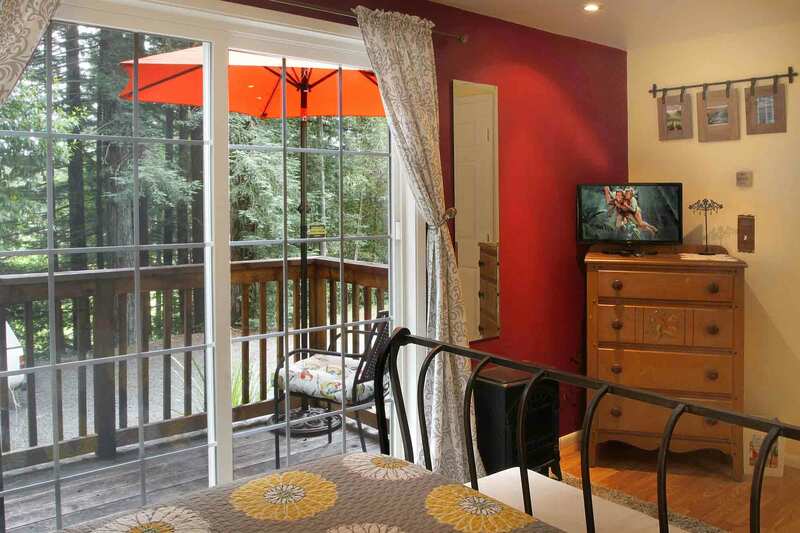 It’s walking distance into a charming little artsy town but you are secluded in the woods The back yard is amazing! The pictures are exactly what you’ll get- It’s just perfect! We had a couple very small maintenance issues and they were addressed immediately- we couldn’t have asked for more. We loved the place. We needed four bedrooms so it worked out perfect. Having a washer and dryer available ended up being a really nice bonus. 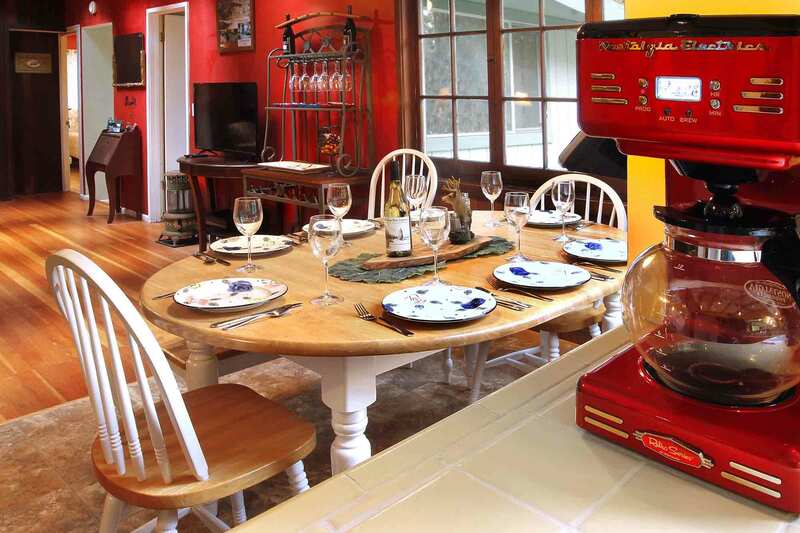 It's close to town and we used it as a home base for wine tasting tour. I highly recommend it. "This was an amazing place"
This was an amazing place. 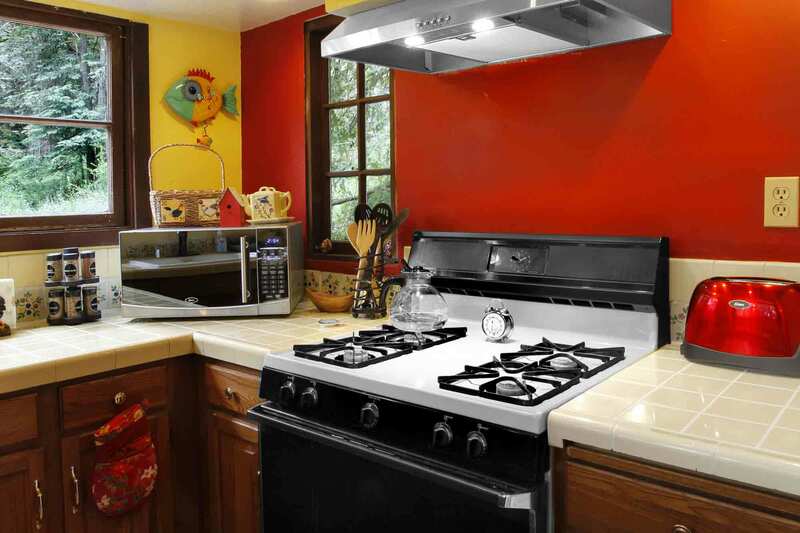 Loved the fully-equipped kitchen as we did a lot of cooking. The home was warm and cozy. The fireplace felt so nice on the cold fall nights. 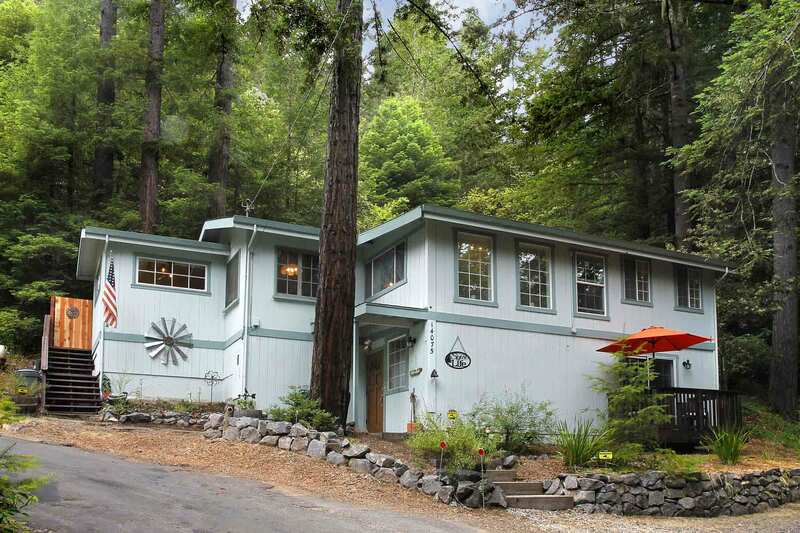 The neighborhood is super quiet, but walking distance to downtown Guerneville. I highly recommend it! "We thoroughly enjoyed our stay at the Spice of Life"
We thoroughly enjoyed our stay at the Spice of Life. Check in was a breeze, the location is woodsy & quiet yet very close to town. The backyard is beautiful with lots of space to hang outside. The hot tub and dog-friendly atmosphere made this house especially unique. We did encounter few crawly critters in the house, as to be expected when you're in a woodsy home. 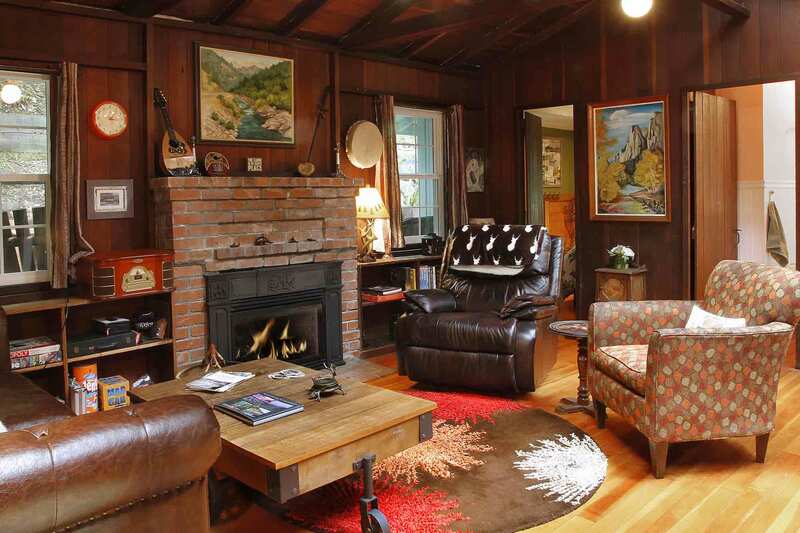 The fireplace was cozy, as were the leather sofa and recliner. We found the hosts to be very responsive and helpful when we called for questions or issues. Thanks again! Thank you so much for the review and feedback, Betsy! It's great to hear that you enjoyed Spice of Life, despite our multi-legged forest residents, and we do hope you'll be back! "Terrific place for a weekend getaway"
Terrific place for a weekend getaway. Convenient location near town, my family and I walked most of our weekend. The place was in clean and orderly condition. The check in process is so great, not having to inconvenience the owner with an arrival/check in time is priceless. I will definitely book the place again. It's so great to hear that you and your family enjoyed Spice of Life and being close to downtown. We appreciate the review and the feedback and definitely hope you'll be back soon, Jorge! Very close to town, surrounded by trees, very private. Loved it! I'd recommend bringing some extra towels and blankets.....I would definitely stay here again. Upon renting "the spice of life" thought it would be more clean and modern. Rented this for a weekend in Wine Country with a 2 other couples. The directions were simple enough to get to .. a little windy road but parking was ample. As soon as we walked in we spotted a dusty rag by the stairs and several spider webs. Even some dead ants the in window seal. Good thing they had cleaning supplies because I had to clean up myself . I just think the cleaning needs to be addressed . I wouldn't say this a terrible rental but I would just do a good once over upon arrival. Thanks for the review and feedback P'Lar. We apologize for the cleaning issues, and yet I do hope that you were able to enjoy your stay in this lovely home and beautiful area anyway. Not close enough to the river to walk. Too many tripping hazards,,the coffee table in the living room nearly took out 3 people because of its oversized wheels. Bedding was comfortable but what couple fits in a double bed anymore? The cabin decor was cute but way too many stairs. for the elderly. Fantastic location in town and in a beautiful setting. Most definitely would stay here again. Thanks for the review John! We're so glad you enjoyed your stay at Spice of Life and hope you'll be back soon. We were a group of 7 with several pups and had a really wonderful time here for a long weekend getaway! 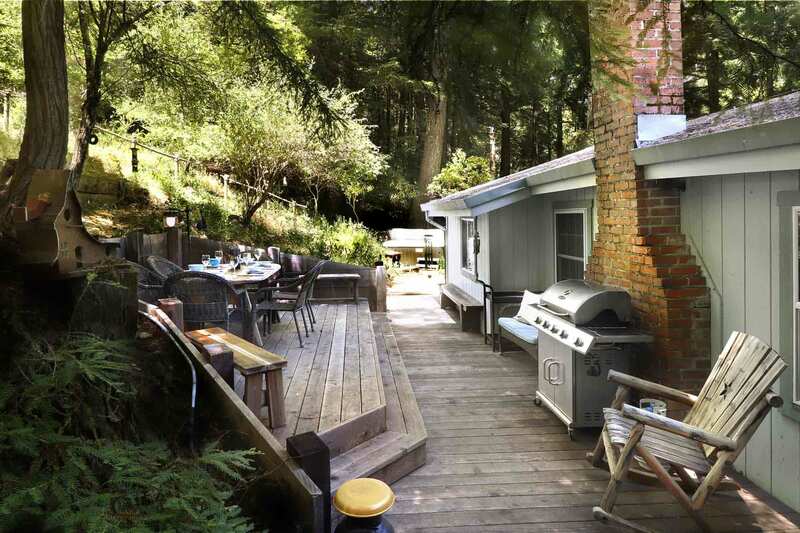 The location was perfect, super close to downtown Guerneville and a quick drive to some ideal swimming spots. The property was clean and spacious. 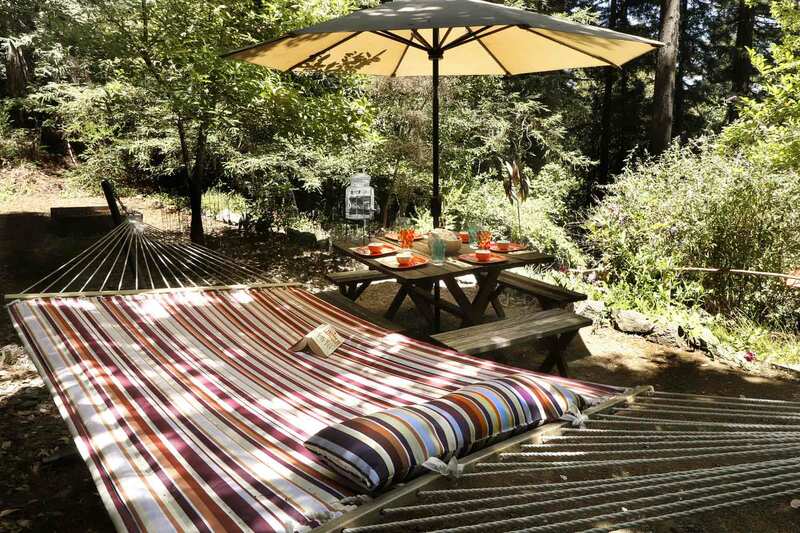 We especially enjoyed the hot tub, grill, patio, and hammock+swing in the backyard. Thank you for a perfect river weekend! "We had a wonderful time at this lovely, quirky, charming cabin"
We had a wonderful time at this lovely, quirky, charming cabin. The location is perfect. 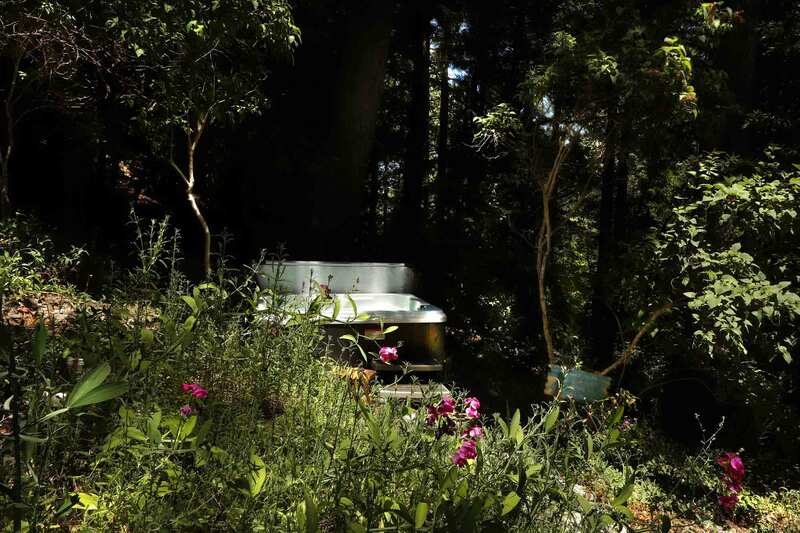 We enjoyed the ample parking, the walking distance to town, the nearby Armstrong preserve and gorgeous Russian River, the fireplace, the vintage radio, the clawfoot bathtub, the hot tub, and the overall decor and views. We loved the backyard hangout area, the cute quirky details throughout the house, and we feel that the property is very professionally managed. The only small issues we had were not quite enough towels, and definitely a few more spiders than made me happy. It IS an old cabin in the woods - but would be good if they sprayed or found a way to deal with that issue. But the rental is new to Airbnb, so it's possible that the place had been empty for a while before we got there and that's why we saw so many. None of us were bitten and the ones we saw weren't poisonous, but it was a minor issue that we didn't love. Overall we loved our experience and felt the price was very reasonable for such a lovely location. Would definitely recommend based on location, natural light, the amenities mentioned above, professionalism and great customer service, ample privacy and yet also ease of access to the surrounding points of interest. Lovely spot. The cabin was lovely - exactly as described, and the hosts were very professional. Communication and check-in were super easy. The place was impeccably clean. 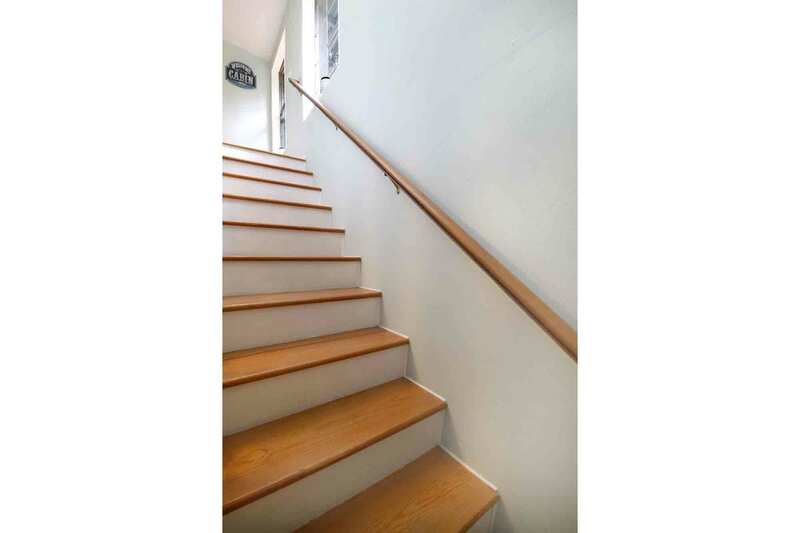 The location is great - walkable to everything in town. Highly recommend! "Thank you for a perfect river weekend!" "Spice of Life was perfect for our family vacation"
Spice of Life was perfect for our family vacation. Booking was smooth and access to property easy. The house was homey and comfortable. There's plenty of common area room for visiting, cooking, playing games. Home had necessary cooking utensils, dishes, pots/pans, etc. The bedrooms/bathrooms are described accurately and clean. Wifi worked well. Outside patio is large and hot tub was clean. Downtown Guernville and a grocery store are 5 mins away by car, but easily walkable as well. We thoroughly enjoyed the location (5 mins from Russian River, 30 mins from ocean, wineries all around and easy < 2 hr drive from San Francisco. Great stay and would highly recommend. We had such a relaxing and fun filled trip to the Russian River. The house was perfect for us, and we loved the outside bbq area.